First modification is to “Pre-generated Your View”. For this you must have .ssdl, .csdl, and .msl files – so you change the “Metadata Artifact Processing property to: Copy to Output Directory.”. Then you process the .ssdl, .csdl, and .msl with edmgen in order to can have the views. Until here , all ok.
A solution is to build them on the pre-build step .But how to generate the .ssdl, .csdl, and .msl files ? What you must change on your project? 2. change the prod with your edmx name. 1. For the average and min the difference is 7%, respectively 20%. Please remember we are using only 3 queries. For the max, it is vey curious : the with is more than without. The penalty is 1%, I think that is a measuring error ? – or maybe not. However , the penalty is small comparing with others. 3. 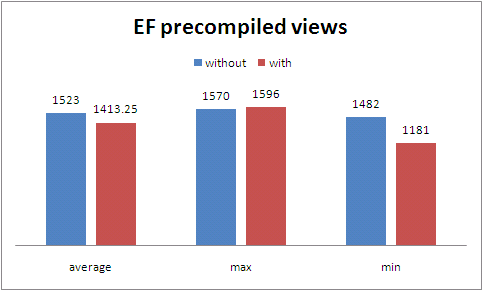 It may worth to add the pre-build step shown before to pre-compile views. Many times you will program against a table that contains something like an enum , like Status( open=1 , close=2, sent=3, approved=4 ) . It is peculiar to wrote those status as text in the other tables – and you do not like also to have update their codes in the C# (VB.NET) code source each time you will add another one. Rather , it is convenient to auto-generate from database at once. 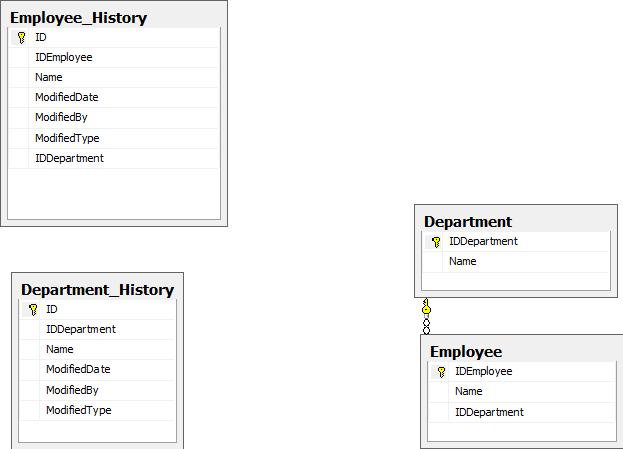 So here it is my own template for such enum from database . To use ,unzip, add to your project that contains the edmx and do what is says below- and you will see as many .cs file as tables want to put. // NO Copyright .Use at your own risk. Usually the data of the tables should be tracking for who modified it. Think about inserting/updating/deleting an employee : you must know who did those actions and when. So you create another table, identically as structure, and you add another 3 fields , such as [ModifiedDate](when), [ModifiedBy](who), [ModifiedType] (what : insert, update, delete). from programming code – every time you modify an object, you remember to modify the history object with appropiate data. In the following I propose an automatically history – that maps convention over configuration in my template, but it is easy for you to modify. The solution works with Entity Framework 4.0 and, for more easily spearation of concerns , with POCO generators. After works, please add any fields to department table and to department_history table(same field names/type) . Re-compile the application and modify the new field in department. You will see the modifications in the department_history table. We create two new tt file that points to the model.edmx . System.Data.UpdateException An error occurred while updating the entries. See the inner exception for details.SqlDateTime overflow. Must be between 1/1/1753 12:00:00 AM and 12/31/9999 11:59:59 PM. The usual method was to start SqlProfiler, monitor the database and see how the sql is constructed. However, the database being used by all developers, it was not so simple to differentiate between all sql’s. and start the exe. That will be all. Do not forget to remove it on release version! Easy to use, valuable information, good!